“Boston Back Bay reflection” by Robbie Shade – Flickr: Boston’s Back Bay. Contrary to popular thinking, utility franchise rights aren’t a big obstruction to microgrids in Massachusetts. That’s the word from a legal analysis released this week by Harvard Law School at the request of the City of Boston. The city, which wants to see more microgrids within its borders, asked Harvard’s Emmett Environmental Law & Policy Clinic to examine how state utility law affects microgrids. The report challenges the commonly held notion that utility franchise rights make it hard for microgrids to run wires across public roads in the state. “There is a widespread misconception that the utility’s consent is required before one can run an electric line across a public way,” said Massachusetts Microgrids: Overcoming Legal Obstacles. This is good news for microgrid developers in a state viewed as a fertile market because of its policy push for clean, distributed energy. 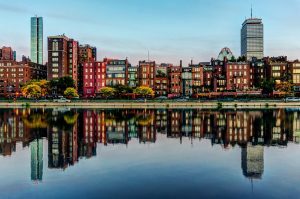 Boston, in particular, sees microgrids as a way to help meet its aggressive community-wide greenhouse gas reduction targets of 80 percent by 2050. Brian Swett, Boston’s chief of Environment, Energy and Open Space, said that the city fully recognizes that “smart grids and district energy will be part of how we reach these goals,” which is why the city engaged Harvard Law School. “Given Boston’s current experience with campus energy systems including electrical, heating, cooling, the city is asking itself if these benefits – lower cost of energy, more resilient power, and lower GHG emissions – can be accrued more widely,” Swett said. Interested in microgrids? Join the discussion on our LinkedIn Group, Microgrid Knowledge. And follow us on Twitter @MicrogridNews. If not allowed to run wires across public ways, microgrid developers are likely to pursue smaller configurations where energy users all reside on the same property. So if the Harvard analysis is correct, it could boost development of complex microgrids, those with more than one energy consumer, possibly third-party owners, and several generation sources. Microgrid advocates had feared that utilities would view such configurations as competition and balk at approving wires being strung across roads. However, the Harvard legal team contends that approval is required only from town and city governments – and local officials tend to be microgrid-friendly as they pursue ways to not only reduce carbon, but also make their power systems more resilient during storms. Why did the misconception about franchise rights arise in the first place? Possibly because of historical practice, said the report. Or it may be because other states only allow utilities to run wires across public way. 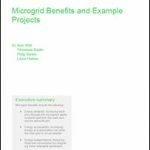 The report analyzed how case law affects a range of microgrid types, from a simple system with a single-owner on a single piece of land to those that have multiple owners and tenants and generation both on and off site. “We find that in all of these scenarios, a microgrid ownership model can be constructed that likely complies with the franchise clause,” said the report. The more complex microgrid does not run afoul of franchise rules, in part because the rules were set up to prohibit energy users from shopping among utilities. In the case of microgrids, consumers are not choosing another utility, but a “new entity” that will continue to purchase services from the utility and will aid the central grid by integrating renewables and demand response, the report said. The Harvard report also found that a recent Massachusetts ruling on electric vehicles may help microgrids. The Department of Public Utilities determined in August that electric vehicle charging stations do not run afoul of the franchise clause since they do not sell electricity as a utility does. Instead, they offer an electric battery charging service. Similarly, microgrids offer much more than electricity. Combined heat and power or district energy microgrids also provide heating and cooling. Other microgrid services include reliability, the sale of demand resources into the regional wholesale market, and islanding during a power outage. “The argument that a microgrid is offering a bundled service rather than exclusively selling electricity is even stronger in the microgrid context than in the electric vehicle charging context,” said the report. The EV model opens the possibility of microgrid models where a third party owns the microgrid and charges microgrid customers a fee proportional to their energy used, the report said.. Authored by Seth Hoedl, Massachusetts Microgrids: Overcoming Legal Obstacles is available here. I understand from your article that Utility franchise rights in the city of Boston are challenging the future directions towards integrated networked smart Micro-grids.